Pupils at a Birmingham school can now get active whatever the weather after having a LazyLawn installed in their playground. 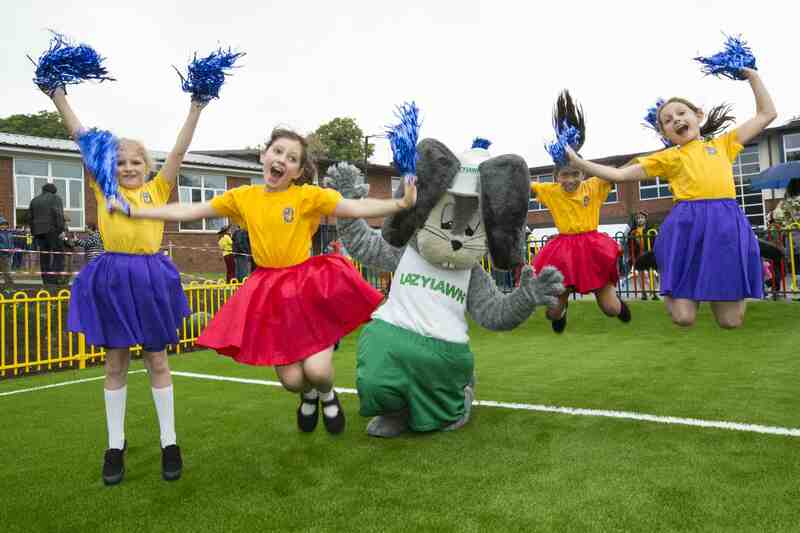 Youngsters at St Mary’s Catholic Primary School in Harborne will be running around in all weathers, after having a 700 square metre artificial lawn installed in their grounds by the UK’s biggest artificial grass brand. The new LazyLawn can be used all year round for playtime, PE lessons and after school sports clubs and will provide an additional outdoor area for the school’s growing number of pupils. John Blaney, a teacher at St Mary’s, comments: “Our school intake is growing year on year by an extra 30 children until 2017, so our pupil population will have doubled to 420 by then. “Therefore, the Governors of St. Mary’s decided to increase the area of our playground with the installation of the all-weather sports surface provided by LazyLawn to add to our existing tarmac area. “Previously the area has some temporary classrooms located on part of it, so it was in a poorer state than a few years before when it was a good, but uneven, grass field. “The surface is now pristine, green and very inviting to run and play on and will be used for playtimes, lunchtimes, PE and after school sports. The LazyLawn is also sure to prove a hit with parents as its no mud, no mess promise means they’ll no longer have to contend with grass or mud stained uniforms. 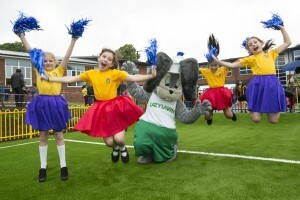 The installation of St Mary’s artificial turf is the biggest school project undertaken by LazyLawn and took a team of four men two weeks to roll out. After removing 250 tonnes of soil in order to level the area, the synthetic turf specialists installed its popular Wonder Yarn 36mm grass, with pitch marks added with white turf. Andy Driver, Marketing Director at LazyLawn, comments: “We worked closely with the school to provide a cost-effective solution to their needs and were able to recommend our Wonder Yarn turf, which is our highest quality turf and has the ability to bounce back. “Wonder Yarn is specifically designed for high traffic areas like this and creates a clean, safe surface for children to play on. LazyLawn is the flagship brand of Evergreens UK, and has seen demand for its products grow by 25% over the last year due to its popularity with schools, nurseries, home owners and businesses looking to reap the rewards of its low maintenance turf. LazyLawn’s artificial turf has appeared in the London 2012 Olympic Village and the Big Brother garden, and has been installed at thousands of schools and nurseries up and down the country. For more information please visit www.lazylawn.co.uk, follow @lazylawn or call 0800 023 2343 for more details.